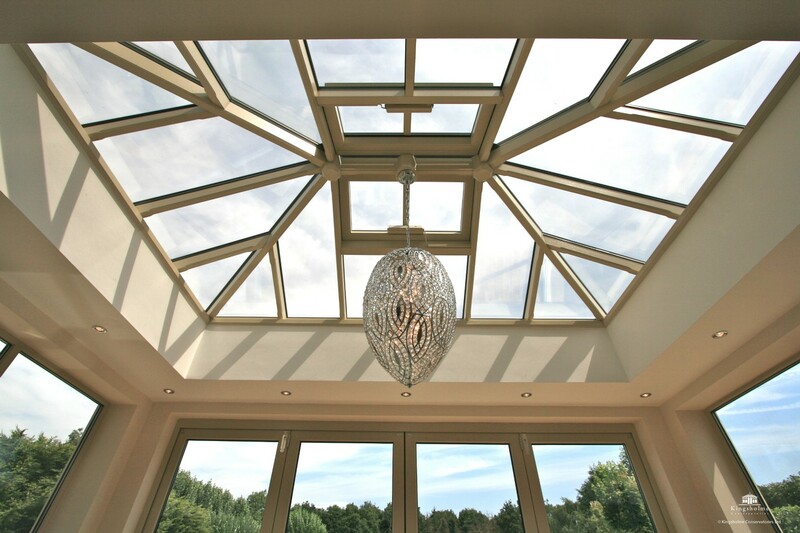 The type of glass best suited for your conservatory or orangery will depend on the design of the room, its orientation and its location in relation to the rest of the building. As a small firm we can react quickly to industry advances and take advantage of the latest available technology, including triple-glazing, self-cleaning, low-e glass with solar-control coatings and even switchable, electro-chromic glass. Pilkington K has been the industry standard for many years, however there are better alternatives available. Low-emissivity glass has a special metallic coating applied to the inner pane, which reduces the amount of thermal radiation escaping from the room. There are currently two alternative methods of applying the metallic coating to the glass. Online or pyrolictic coating (e.g. Pilkington K) is known as “hard-coat,” off-line or vacuum coating (e.g. SGG Planitherm One) is known as “soft-coat”. We use the latter as standard to provide the best possible insulation. The double-glazed units are also filled with argon gas, this conducts 33% less heat than air and improves the overall insulation value of the double-glazed unit. Overheating in conservatories has been a big problem in the past, however improvements made in solar control glass have trickled down to the domestic market. It is now usual for us to install glass that will block out 82% of solar radiant heat. A side effect of reducing the degree of solar heat transmission is a drop in the amount of visible light that will enter the room. However there are various options available , with different colour tints, that offer differing levels of light and solar heat transmittance. Pilkington Activ™ is the most widely known brand, and is the world’s first self-cleaning glass to use a microscopic coating with a unique dual-action.